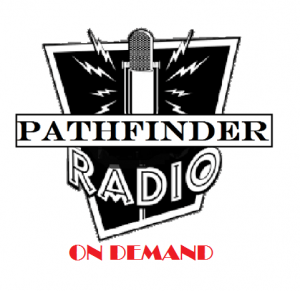 Welcome to PATHFINDER RADIO ! SPIRITUALLY SPEAKING tackles spiritual discussion on a level that no one else discusses it on. Every broadcast is aimed at making spiritual matters clear and understandable. Every subject is considered. Every discussion is aimed at helping everyone on their spiritual journey. Not preachy or condemning just good solid discussion! MEDITATIONS is a show aimed at helping you meditate on a Biblical, spiritual level. MEDITATIONS is a time to clear your mind and relax. Different scriptures dealing with a different topic each week will be read along with some great commentary aimed at helping you develop a strong peaceful mind and to practice and invite God’s presence into your life. GREAT MUSIC! GREAT DISCUSSION! GREAT SPIRITUAL INSIGHTS! FREE RESOURCES FOR ALL LISTENERS! NOTE: Pay no attention to references during broadcasts below regarding: Twitter live discussions. Reference to website WayoftheRaven.net. Mixlr. Pathfinder Radio blog at blogspot.com. References to being live on Mondays and Wednesdays. Those are old references. You may listen, download and save by clicking on a link below. Is It Possible To Live Spiritually In Our Everyday Lives? How Could Jesus Claim To Be The ONLY Way? Is There A Sin You Can’t Be Forgiven Of?